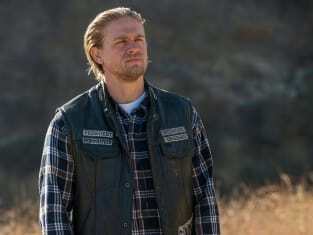 Is Sons of Anarchy Season 7 Episode 8 the beginning of the end for Jax Teller as the head of SAMCRO? As he sat on that rooftop Jax resembled a lost little boy, or a man who's lost his resolve to continue the blood shed. Unfortunately that moment of contemplation didn't last long. 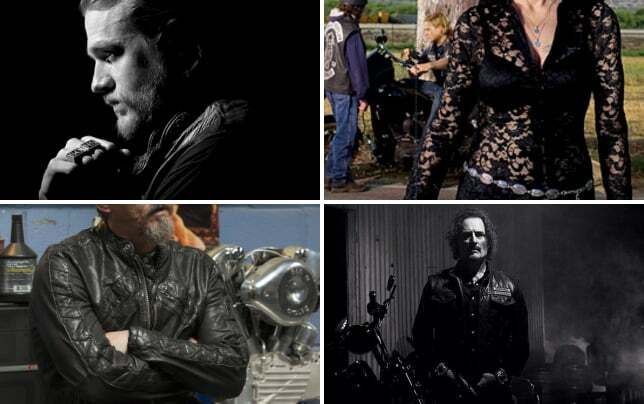 Chibs was quick to convince him that he'd put SAMCRO on this path and they needed their leader to see them through. 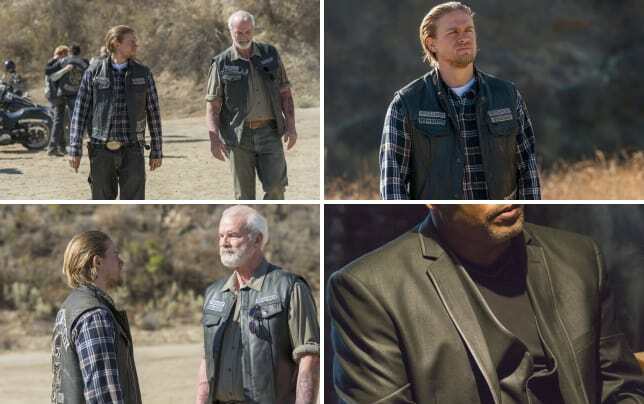 Sons of Anarchy Photos from "A Separation of Crows"
When Chibs told Jax that the Sons of Anarchy had a duty, a mission, I couldn't help but wonder exactly what that was. To avenge Tara's murder? Chibs talked about the brutality that was inflicted upon Jax's family. Little do they know the person who committed the act is family. As I watched Jax and Chibs I couldn't help but think what a dichotomy Jax Teller is. He's capable of loving those closest to him fiercely yet he's equally able to commit horrible acts of savagery. Perhaps those are traits he inherited from his mother. Killing Jury may end up being part of Jax's undoing. Yes, Jury was pulling his own gun during that fight but that's not what the other members of SAMCRO will remember. It's that a charter President was killed for being a rat without bringing it to the table. Was shooting Jury a matter of self defense or the club version of vigilantism? Elsewhere, Juice was busy playing let's make a deal to get close to Lin in prison and Unser was quick to figure out his plan. Unser is a great investigator with plenty of experience and good instincts. Right now those instincts are telling him a piece of the puzzle is missing and it has to do with Juice and Gemma. I look forward to the moment he puts it all together. And Nero was right. If Jax and Gemma really care about the safety of those boys they will send them away to Nero's farm with Wendy. But with the club and self preservation taking priority, it seems as though Nero and Wendy are the only two people putting Thomas and Abel's well being firt. Once again, we were left with Jax receiving a box. I found it oddly amusing that not one of these men who have killed so many and seen so much bloodshed seemed willing to open that box to see what body part had been sent to them this time.